Three triple crochets in same stitch. Similarly, two triple crochets in the same stitch would only have two diagonal stitches, and double and single crochets only have two/one horizontal slashes, respectively. • Working with Black Thread? Try this trick. • What Makes the Best Row/Stitch Counter? • How to Hide Tail Ends of Thread. Triple (and double) bobbin in triple crochet: Triple crochet in stitch, holding last loop on hook; repeat twice (once) more, ending with thread through all four (three) loops on hook. Double- and Single-Crochet triple (double) bobbins symbols have two and one slash, respectively, instead of three slashes. A Slip Stitch is simply a dot: . What is THE best way to knot together two loose thread ends? This is the best way to invisibly and securely attach two raw ends of thread. You can snip the threads very close to the knot, roll the knot in your fingers to combine any loose fibers, and continue on with your work. Print this graphic out! Make several copies! Put it in a Safe Deposit Box! Keep it with you always. An easy way to make crocheted fringes. The only drawback to this method is that the size of the fringe is limited to the size of your middle finger. 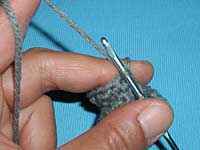 1: Insert your hook into the stitch, with your middle finger laying over the thread (yarn). 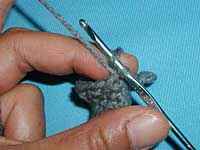 2: Grab the thread from over your middle finger, and pull through stitch. 3: Go back up and grab the thread from over your middle finger again, and pull it through the loop you just made. 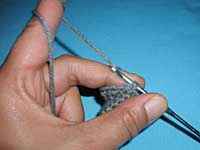 4: Remove your middle finger, pull loop all the way through, and tighten to knot it. Is working with black thread/yarn making you cross-eyed? Going cross-eyed when crocheting with black thread? Place a white cloth on your lap behind your work. It makes the stitches easier to see! What is the best stitch counter on the market? Common Bobby Pins make the most fantastic stitch counters. And they're cheap! How do I hide loose ends of thread? 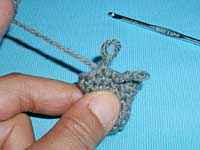 You could use your hook to weave through your tail ends of thread; but hooks tend to stretch the stitches, and especially with fine crochet stitches, this process can be rather tedious. A much better way is to use a tapestry needle to quickly 'sew' the raw thread end through the stitches, pull the thread taught, and then snip. When you pull the piece back into shape the raw end will disappear into the stitches. If you're doing tiles (many small blocks), reserve a long tail on one of the blocks, and use that same threaded tail to sew together as many adjacent blocks as possible. Have a Great Tip? Contact Us!